If a big, blue genie popped out of your coffee cup, would your first wish be for more time? If so, you might be surprised when the genie granted you an improved workflow, but it would make sense. After all, an efficient workflow can be a content marketer’s gateway to more time and free nights and weekends. Right now, companies are investing in content marketing. 70 percent of B2B content marketers expect to produce more in 2017, and 39 percent of companies expect to increase spending. That means more work for you—but not less time, if you’re smart about your workflow. Content marketers are not approaching workflow the right way. The quickest path to improvement is documentation. A documented workflow will use money more efficiently and free up time, while allowing marketers to produce more content. As teams work content through these stages, information often moves from spreadsheet to email to Word document and back again. Team members find themselves running around hassling each other for updates, leading to inefficiency and frustration. A well-documented workflow creates transparency and accountability. The Content Marketing Institute’s annual report shows less than half of marketers currently have a documented content marketing strategy—37 percent of B2B and 40 percent of B2C. The key word is here is “documented.” Lots of content marketers have a verbal strategy—but effectiveness increases when the strategy is both documented and communicated. 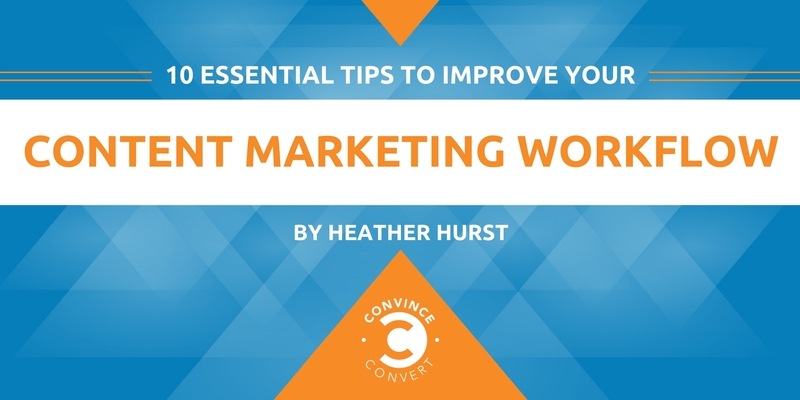 Take back your time—with or without a genie—by using these 10 essential tips to improve content marketing workflow from start to finish. If you read these 10 tips and still want more, you can read this article or watch this webinar for 30 tips. Tip 1: Establish both a process and a person to receive work requests. Processes become inefficient and overly complex when there isn’t a specific owner. Assign a person to own this process—not to do all the work, but to act as the responsible organizer. Tip 2: Require that requesters complete a results-oriented creative brief. A creative brief is usually a one-page document that outlines the content goals, messages, format, design, and expected ROI. It may seem like a simple task to produce a creative brief, but things get a little tricky in getting people to actually fill out their creative briefs. I’ve worked in both agencies and corporate settings where employees submit only partially completed briefs. People use “ASAP” as a deadline (! ), or say “stick to corporate standards” for tone. In a survey of ad agency executives, 53 percent of respondents reported creative briefs lack focus, and 27 percent reported the briefs as incomplete and inconsistent—more than half of all briefs don’t provide clear information to guide the process. The creative brief should be universal, simple, and results-oriented. Create one creative brief that works for all your request types. Balance keeping the creative brief simple with obtaining enough information to make targeted marketing decisions. Define expected measures of success for a specific request. Tip 3: Rank all requests by priority. Not all content requests should be considered equal. “Just because someone put an exclamation point on the email they sent to request it doesn’t mean it’s as important or more important than other things,” says Matt Heinz, founder and president of Heinz Marketing. He recommends using a system to rank priorities based on the potential impact of the content. “You can’t get everything done right away. You can’t get everything done, period.” When you’re filtering requests, some requests will be urgent, but others will be both urgent and important. Don’t lose the important chasing after the urgent. Let’s look at an example. At a late-night visit to the ER, you go to triage to be admitted. Here, a medical professional takes your vitals, listens to your complaint (usually rating pain on a scale of one to 10), and evaluates your condition. If the person screaming the loudest always got in first, the guy with the stubbed toe might get treated before the heart attack patient. When you have limited resources, use the triage process to put the most urgent and important cases first. Tip 4: Create process outlines for content production. Improve overall prioritization by understanding how long content actually takes to create. If you don’t document the steps you take for content production, analyze how long each step takes (using historical data), and consider transition times (waiting for reviews, approvals, etc. ), you’re not going to know what is really on your plate. Hofstadter’s Law states that projects are always going to take longer than you expect. Folks at Orbit Media found in their 2016 survey of thousands of bloggers that the average time for a blog post is 3 hours, 16 minutes, which was a 26 percent increase from the previous year. Take this article, for example. It might seem like a simple piece of content to produce. You write some words, find a picture, and publish it—done! But there’s a lot more to it, especially when you start counting the minutes. Identify clear stages and time to complete them for each type of content you produce. Tip 5: Leverage automation and reminder tools. When it comes to content creation at any level of your workflow, the more you can automate, the better. Reminders don’t have to be e-mail reminders or pop-ups; they can be any system you use on a regular basis—even a handwritten daily checklist. Hubspot reminds us that, for tasks we do over and over, “Why not automate [those actions] so you can spend your time on new projects?” Automated reminder tools help you be more consistent, save time, and get more done—win, win, win. Establish criteria to determine when a content piece is “done” to keep the content process moving forward smoothly. For example, you can designate two reviews and an approval to eliminate excessive reviews at the end of production. Tip 7: Establish a content storage process with a protocol and naming system. After content is created, how will you store it and make it available to other people? Think about how many times someone has come to you asking for your corporate logo—content that should be easily available to everyone within the organization. Make sure you have a coordinated, simple, and efficient content storage process. Use a standardized naming system. This could include the date in a consistent format (i.e., 2017.07.01) at the beginning or end of the file name. Create a naming convention that everyone both understands and uses. Tip 8: Create a hand-off process. A process to hand off content to the teams using it saves time. Whether you’re sending finished work on to sales enablement, demand generation, or your blog department, incorporate a clear hand-off so teams will know a piece is finished and ready for promotion. Tip 9: Publish and promote content based on your distribution strategy. Be strategic and smart about how and when you publish and promote content. Just because you finally finished that ebook last night does not mean now is the right time to publish. You won’t get the ideal number or type of eyes on it in a haphazard push. When it’s time to publish, remember distribution best practices. Use technology to improve distribution—hashtags, links to popular posts, or automated influence-enhancement systems (think dlvr.it, GaggleAMP, or Triberr). Did you meet your planned ROI? Determine whether the content you’ve built has achieved the goals you set out—maybe using some of these analytics reports. Let information about past content inform your plans for new content. Find out the topics people liked, content the sales team used, and unexpected attributes that drove demand. Circle back to measure results as often as possible. You can check out this ebook to learn more about content marketing metrics. Now, put these tips to work. Your more efficient workflow will result in fewer nights and weekends spent at work, more successful budget requests, coordination of efforts across areas, quicker content delivery—and less time spent overall. Thank you, workflow genie—looks like I didn’t have to use my wish for more time after all! 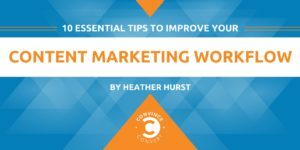 Heather Hurst is the Director of Corporate Marketing at Workfront, where she leads the company's AR, PR, social media, and content strategy. Heather has more than a decade of BtoB and BtoC experience helping companies tell their stories in the changing media landscape. Get more work management tips on Twitter and LinkedIn.